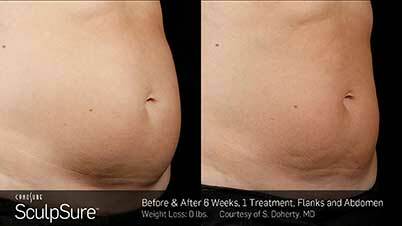 *25-minute, non-invasive procedure with minimal downtime! 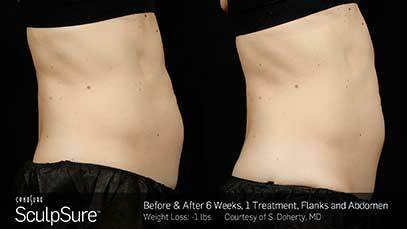 We were one of the very first offices to offer SculpSure. We have extensive experience treating many different areas and all body types. SculpSure is a breakthrough in non-invasive body contouring that treats bothersome areas of fat, helping you achieve the shape you want. *The 25-minute procedure uses light-based technology to eliminate up to 24% of treated fat in problem areas such as the abdomen and love handles. This treatment is only available at our NYC office. SculpSure NYC non-invasive body contouring is ideal for people with trouble spots, particularly those that seem resistant to diet and exercise. *Clinical studies performed were based on patients having one treatment. However, you may wish to have additional treatments based on your desired results. When you come in for your consultation at our New York office, we can discuss the best treatment plan for you. *Most patients feel a tingling sensation intermittently throughout the treatment which is generally well tolerated. *Many patients start to see results as early as 6 weeks following treatment as the body begins to evacuate the eliminate fat cells, with optimal results usually seen at 12 weeks. 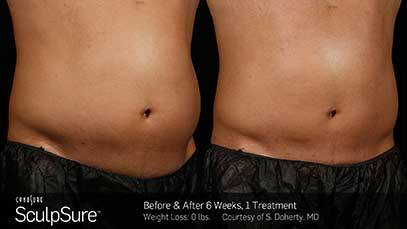 Treated fat cells are eliminated during the treatment. To maintain your results, we recommend following a healthy meal and exercise plan. *Due to the non-invasive nature of this treatment, there is minimal downtime with SculpSure. You can have the treatment during your lunch hour and return to work immediately. Our NYC patients especially love this because it doesn’t interfere with their daily lives at all. The number of fat cells stored in our body typically remain constant throughout adult life. 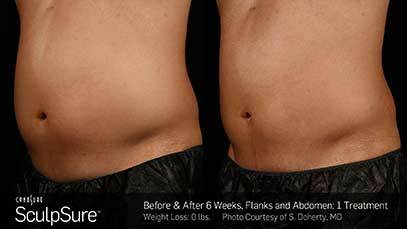 *After the SculpSure body contouring treatment, with a healthy lifestyle, the treated fat cells may never return. However, as we lose weight, the size of the fat cells become smaller. Even with diet and exercise, many people have difficulty losing weight in these troubled areas.